The second boutis "Cathedral Window" that I started back in February is well under way. 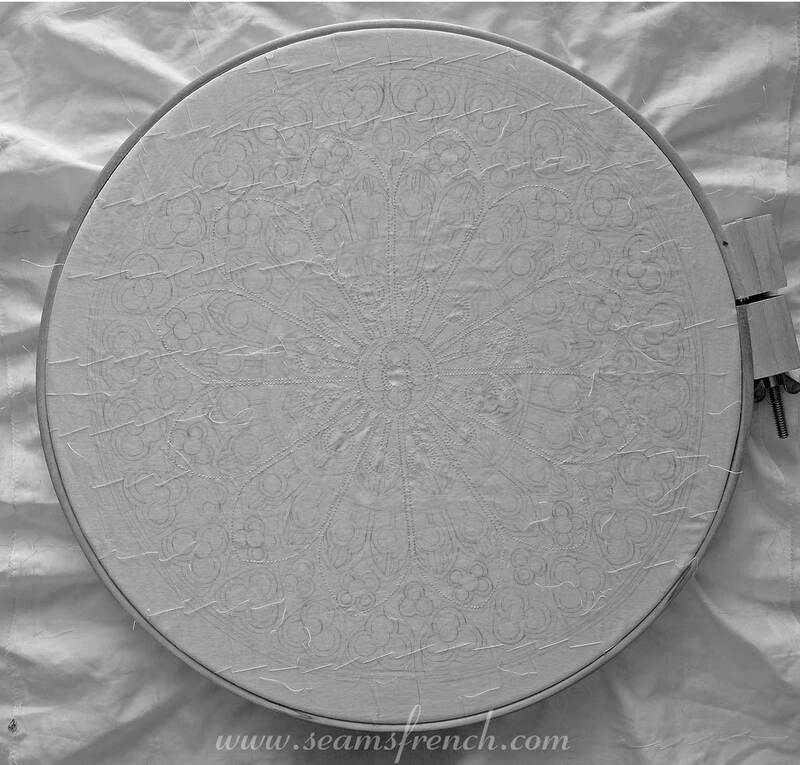 Just as in machine quilting, when stitching boutis, the first step is to stabilize and secure the major design lines, working from the center out. 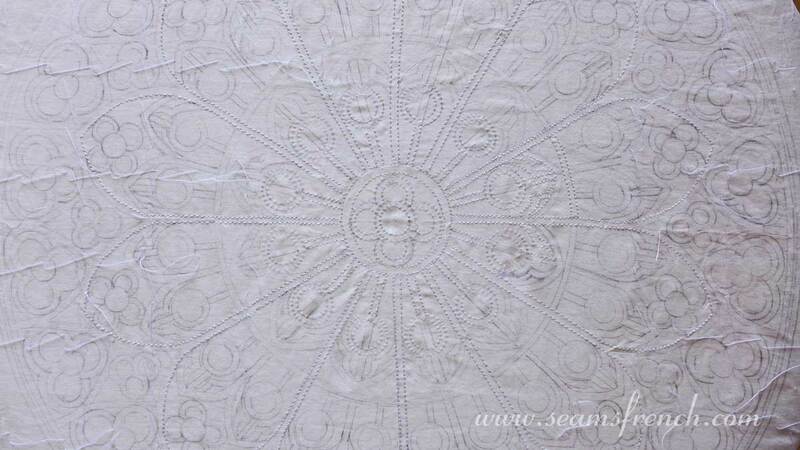 So, starting at the center rose, all of the large arches and channels radiating from it were stitched first. Black and white photo of the entire design. Colour image of the same photo. Next, I continued with the first inner row of half arches, working the short, middle bar towards the rosette, and then on to the smaller arch. 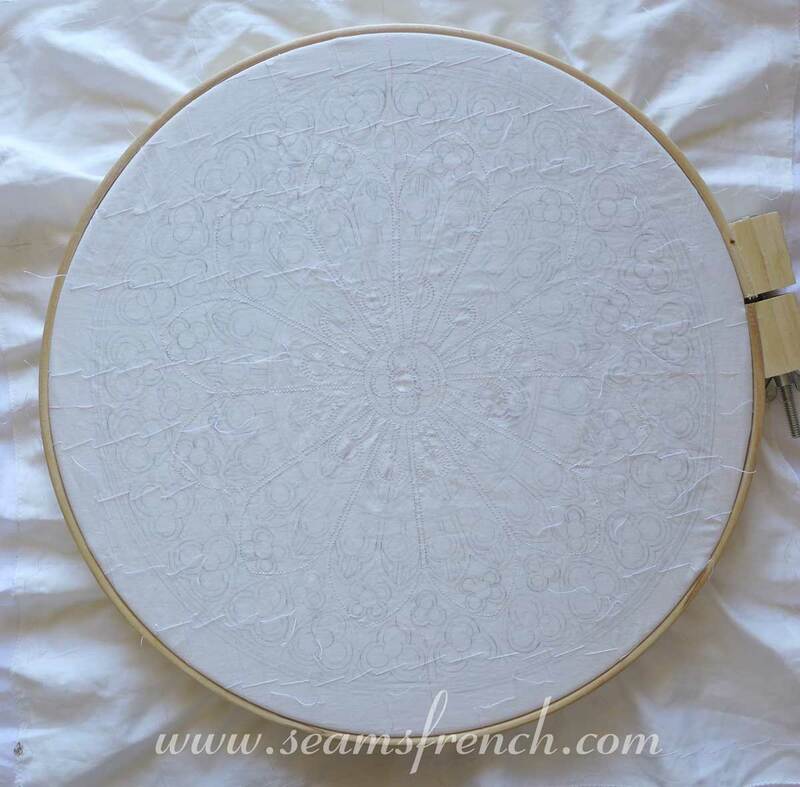 From there, each following segment in the circumference will be stitched sequentially. Some of the most impressive antique boutis quilts that I saw in France were stitched only with "point arriere" (a tiny backstitch). When I first had the opportunity to see these stitches close-up, I was completely blown away by the perfection of the stitch, both front and back. 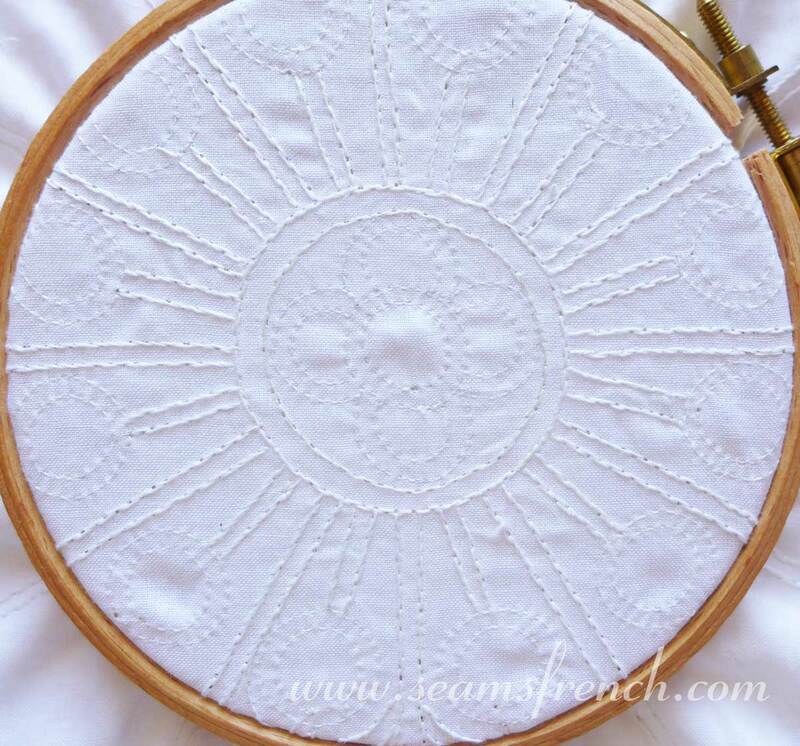 The meticulous stitches were tiny and consistent and it was difficult to fathom that these stitches were in fact hand made, not machine stitched, but Madame Nicolle, the proprietor of the "Maison du Boutis" in Calvisson, France, assured me they were the real deal. 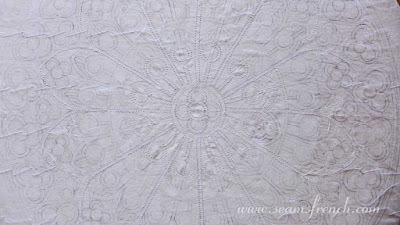 With those quilts as my inspiration, I have decided to stitch the entire cathedral window, other then the rosettes, with the "point arriere". This stitch does slow down the process, but as with everything, practice will improve the speed and consistency, and I'm up for the challenge. 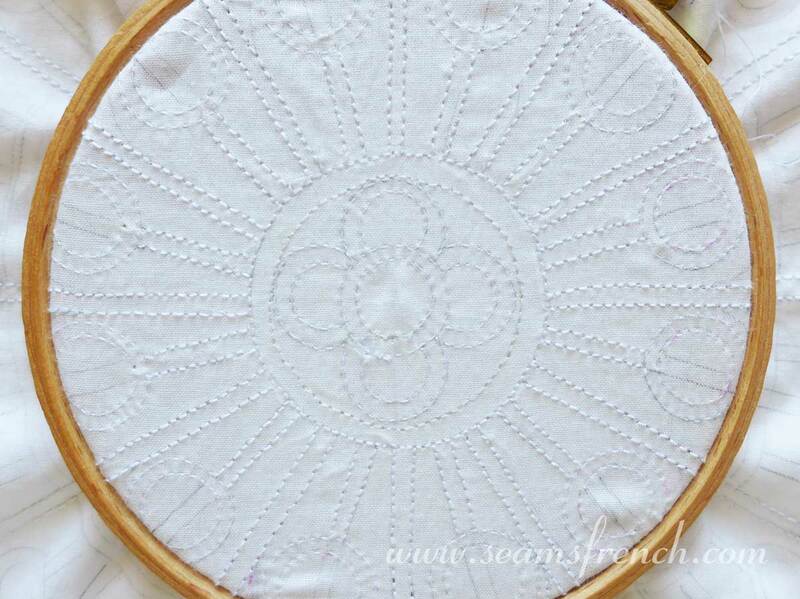 I'm using a Gutermann hand quilting cotton thread with a size 10 Bohin quilting between needle. The front of the work, showing a close-up of the backstitch. 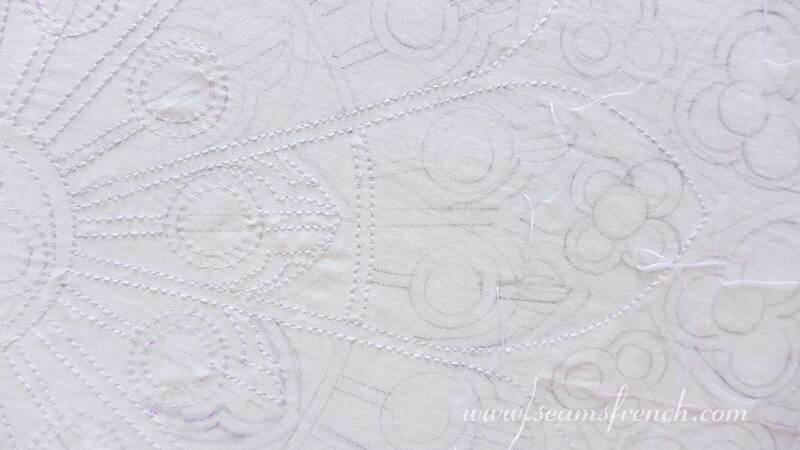 The back of the work, showing the underside of the backstitch. For the time being, I'm stabilizing the rosettes with a running stitch. 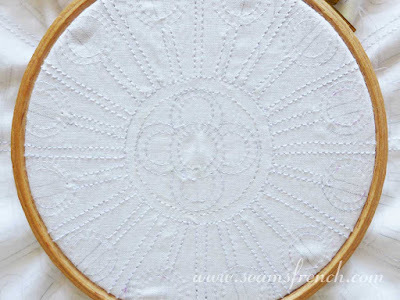 Once all other stitching in the piece has been completed, I will work a "point de rosette" (a needle lace rosette) into each circle. This will be my first attempt at this delicate pattern, but while in France, I had the opportunity to learn to make this rosette from one of the women in the boutis group that I participated in. Hopefully the notes I made and the pics I took will help me remember her instructions. There will be practice runs first! The very first knotted thread that I pulled into the work made a tear in the batiste. Nooooooo!!!! The fabric is more delicate then I had anticipated. Thank goodness I had decided on the "rosette". It will completely cover the damage. OMG, was that knot for the cording? But, maybe it is lucky you discovered the issue now, in a place where it can be hidden. I hope it all goes smoothly from here, because it's going to be gorgeous! I couldn't believe what I had done when I pulled that first knot through. My first thought was that I had no option but to start again. However, once I calmed down a tad, I realized that the stitching for the rosettes would completely cover the damage. Whew! It was just the regular quilting thread for the stitching that caused the problem; the same thread I always use. However, I had not used this particular batiste before. It was a very delicate (and expensive!*!) Belgian cotton that I purchased at one of the boutis exhibitions in France. I had been saving it for a worthy piece. I was not expecting the fabric to be as fragile as it is. 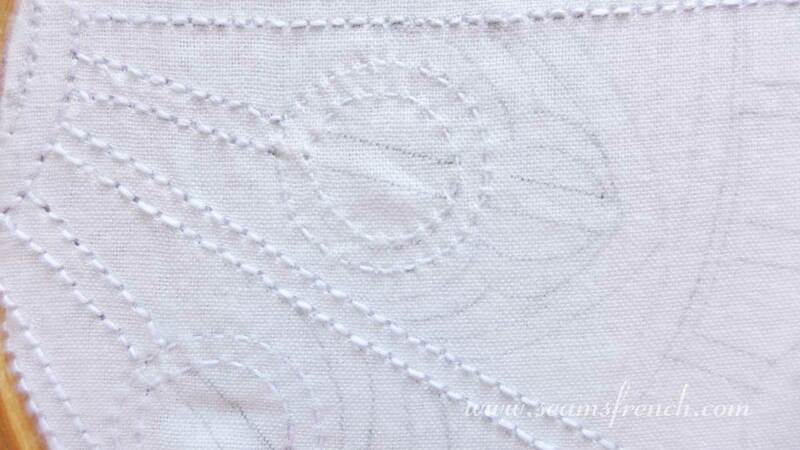 And you are very right, best to have found out on the first stitch, particularly in a place where it will be hidden. Caution (and a less cavalier attitude) rules the day from here on in. This will be absolutely exquisite! What an undertaking. So sad about the tear but happy so soon you found your answer! Love this piece! It's got a long way to go, but I am happy it's in progress. That tiny backstitch looks time consuming, but it will be beautiful! I thought all boutis was running stitch, but that shows you how little I know. That little tear is frightening! but at least it will be covered. The running stitch is the most common, (and efficient) stitch used for boutis, but the backstitch really does take it up a notch. When I am in "the groove",(so to speak), that little backstitch can whip up quite quickly. However, that "groove" isn't always there at my beck and call! But, for this project I am committed to it and will see it through. Assolutamente un lavoro fantastico, tantissimi complimenti!!!!! !